Which is better, a compact fridge, or a beverage center? What’s the difference? Don’t they both just keep stuff cool? Yes, they both keep stuff cool, but that isn’t the only consideration when choosing one to buy. Let’s explore 5 key differences between mini fridges and beverage centers to help narrow down the choice that will best suit your needs. 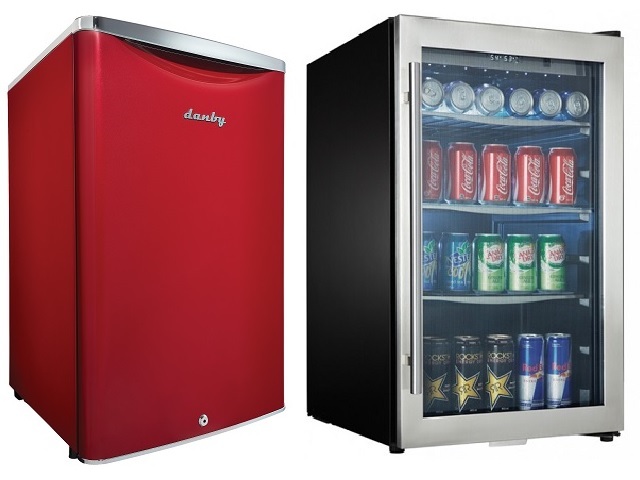 A Danby beverage center is designed specifically with one purpose in mind: cooling drinks. The internal space and shelving maximize storage space for cans, bottles, or even drink boxes. Some beverage centers are even listed by their beverage can capacity rather than the usual cubic feet (cu. ft.) storage capacity used by other refrigeration units. But wait – can’t a compact fridge keep drinks cool? Yes, they can. However, a mini fridge was not designed for the sole purpose of storing and keeping drinks cool. The result is an interior storage area designed to handle a wider variety of shapes and sizes. If a compact fridge is used exclusively for the storage and cooling of beverages, there may be some dead space – empty areas that contain nothing but air. Depending on the size of the fridge and layout of the shelves and door, it may not be able to hold as many drinks as a beverage center. Danby’s compact fridges are just that: fridges designed for smaller spaces. Great for dorm rooms, family rooms, guest rooms, home bars, or even senior suites. They have the look, feel, and design of a regular size fridge, but are scaled down to fit nicely in any area where they can be conveniently located for quick, easy access. Some people just want an appliance to keep their drinks cool at the home bar. A beverage center may be the solution for them. Do you want to chill more than just drinks? What about dairy products, or other foods that rely on cooler temperatures to stay fresher longer? Perhaps a compact fridge would be the better choice. Depending on the model, a beverage center can cool drinks to temperatures as low as 4 degrees Celsius. While this is a nice, refreshing temperature to enjoy a favourite drink, it will not keep ice cream frozen. Many compact fridges, on the other hand, can be set to temperatures lower than 4 degrees. Some even come with a separate, built-in freezer to store a variety of frozen foods. Some people say it is not what’s on the outside, but what’s on the inside that counts. This is not always true with appliances. Reality is that appliances have to be placed somewhere, and therefore take up a defined space. Whether looking to purchase either a beverage center or a mini fridge, always keep in mind the amount of room available to install the new unit. What a disappointment it would be to get it home and realize it is too big to fit the intended space! Measure the length, width, and height of the area where the appliance will be kept before heading out to nab a unit that will look great under the counter. Be sure to check the dimensions of Danby’s appliances for a listing of their external measurements. It is included under the specifications section under each product listing. The other important measurement to consider when purchasing a beverage center or compact fridge is the unit’s internal storage capacity. Danby’s beverage centers range in size from 2.6 cu. ft. up to 4.34 cu. ft., while the compact fridges start as small as 1.6 cu. ft. and go all the way up to 4.7 cu. ft..
How will the unit look nestled against a favourite recliner in the family room, or under the counter in a senior’s apartment? A student heading off to college may not care if their compact fridge matches the eclectic décor of a dorm room, but in most other settings, an appliance needs to match the look of the room and furniture around it. And just in case you are wondering, black will go with just about any décor in that dorm, regardless of how eclectic the roommate’s taste. Beverage centers have a unique look and feel. The main body of the units are black, with a grey/silver-framed, clear glass door. With this transparent door and constantly-lit interior, all the contents are easily visible at a glance. Danby’s compact fridges do not have a see-through door. However, they do come in a wider variety of colours to match the personal taste or style of any room they are in. From classic white, to modern black, to chic silver – some even come in retro red! There is no definitive answer regarding which is better, a compact fridge or a beverage center. What fits one person, situation, or room may not be a good fit for another. When considering your upcoming purchase of a new appliance to keep food and/or drinks cool, perhaps start with a list of what the unit should be designed to do, what it will be used for, the available space for installing the device, and the overall look of the room it will be kept in. This will help choose the appliance best suited to your needs. With their size and affordability, a truly great home bar could be set up with both – a beverage center for chilling drinks, and a mini-fridge for keeping perishables fresher longer. Psst… We’re on social! Follow us on Facebook, Twitter or Instagram for more posts like this.